Stinging insects are scary enough without the threat of a severe allergic reaction from their painful stings. While many people will only have slight irritation and swelling after getting stung by a bee or wasp, others can experience a severe allergic reaction called anaphylaxis, which can be life-threatening without emergency care. Allergy doctors often get questions about stinging insect allergies, so we’ve got a few answers here to help you prepare for your next visit to an allergy specialist. 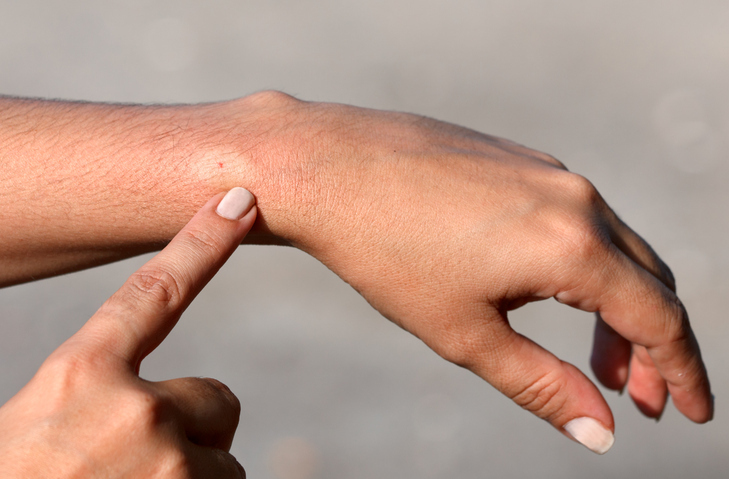 What types of insect stings can cause allergic reactions? Honeybees, yellow jackets, paper wasps, hornets, and fire ants all have venomous stings that can cause allergic reactions. If you have had an exaggerated reaction to one of these insect stings before, it’s helpful to accurately identify the insect that stung you, so you can tell your allergy doctor. Often, if you’ve had a bad reaction to an insect sting, you are likely to have a more severe allergic reaction if you’re stung again. How do I know if I have a stinging insect allergy? Unfortunately, there is no way to know your risk of a stinging insect allergy unless you have been stung by an insect and had allergic symptoms. If you do get stung and experience itching over a large area of the body, swelling of the tongue or throat, coughing or wheezing, dizziness, stomach cramps, or low blood pressure, call 911 right away and schedule an appointment with an allergist after you get emergency care. Localized swelling and redness at the site of the sting is not an allergic reaction. What can I do about insect allergies? Once you learn that you do have a stinging insect allergy, you should talk to your allergy doctor about carrying an epi-pen with you at all times. You can also take measures to avoid contact with insects, such as not walking around barefoot outside, keeping your landscaping trimmed, and using insect repellant. There is also a treatment called venom immunotherapy, which can dramatically reduce your chances of experiencing an extreme reaction. If you do have insect allergies, you should not hesitate to talk to an allergist and immunologist about your treatment options before another extreme reaction occurs. For allergy care in Blue Bell, Lansdale, Philadelphia, Jenkintown, Pottstown, King of Prussia, and Collegeville, Pennsylvania, you can count on Allergy & Asthma Specialists SM. Call us at 1(800)86-COUGH to learn more about what we do.